HARRY POTTER IS A WIZARD! I decided to do a Harry Potter reread session because I've got to the point of feeling completely read out and not being excited about anything that was on my TBR shelves. For me reading Harry Potter again was a bit like going back to the reading equivalent of a comfort blanket. 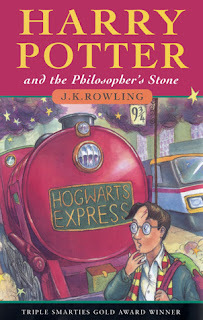 For me the first Harry Potter book is the book that got me back into reading fiction after spending a good chunk of my teen years not knowing what to read. It was like revisiting old friends and the experience of reading a book I know so well was really interesting. For me this book while not the darkest or most exciting of the series really sets up the world and the characters and gives you a real grounding in a world you become completely immersed in. I found myself comparing the book to the film by picking out bits that hadn't been transferred over to the film and reminding myself of small details that I'd forgotten. For me the character of the piece has to be Hermione. I had forgotten how much of an outcast she was at the start, hiding behind her cleverness to try and mask the fact that she is actually quite a lonely soul. I loved the Weasley's from the first moment they stepped onto the page and I'm now sadly at the age where I wanted to mother Harry from the moment you heard how horribly the Dursley's had treated him. I'm hoping to reread the entire series over the next few months. I cannot wait as retreading this first instalment was a pleasure. I remember falling in love with Harry-it actually wasn't until the Mirror of Erised chapter that I did but after that, it was smooth sailing because the books are just that good.